The objective is to draw a path from the entrance of the maze to the exit. 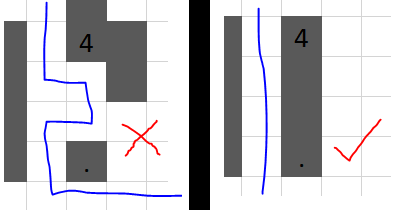 Every square in the grid is either part of the path, or a wall. A dot represents a section of wall that must be included as part of a numbered wall block. Walls can only exist as numbered blocks. 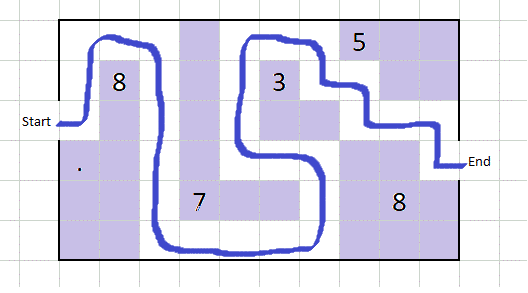 There can be no walls that are not connected to a numbered block. The path may only connect orthogonally adjacent squares. 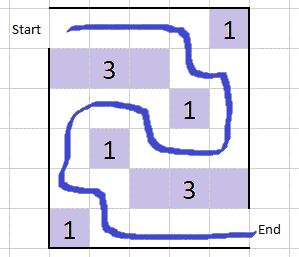 The path may not intersect any of the walls in the maze. Using these rules, it should be possible to solve the following boards. I think the puzzles are fun, for what it's worth! Not the answer you're looking for? Browse other questions tagged logical-deduction puzzle-creation grid-deduction mazes or ask your own question.